This page is devoted to information about equipment useful for birding. eBird - The eBird website is a real-time, online checklist program. It was created in 2002 as a joint project of Cornell Laboratory of Ornithology and the National Audubon Society. 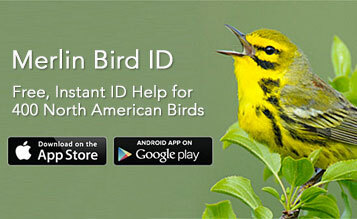 eBird has a mobile app for iOS and Android available on the App Store and Google play. Another useful app that uses eBird data is called Birdseye. Birdseye is particularly useful when traveling to unfamiliar areas.